Your kid might want the hottest toy trend on You Tube but as a parent, you know those must-have toys are forgotten just days after Christmas. 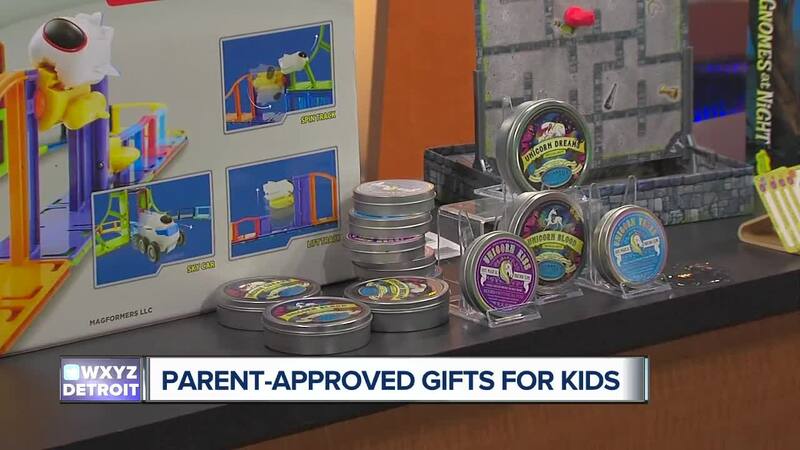 SOUTHFIELD, Mich. (WXYZ) — Your kid might want the hottest toy trend on You Tube but as a parent, you know those must-have toys are forgotten just days after Christmas. Mompreneurs, Carly Dorogi and Sherri French from Capital M Moms share ideas when it comes to holiday gifts that both kids and parents will love. stop faster and safer than ever before. ready to ride in 10 minutes. customers giving them a perfect 5-star rating. • We like to say... It'z simple! It'z fast! It'z letters! It'z laughs! loops, ups and downs, and twists and turns for endless flight fun! your track is completed, the sky shuttle can go off-road in its sky car! to simply stack and store the pieces. literal blood, sweat and tears for unicorn conservation. saves a mermaid through donations to ocean conservation. huge instagram community for our fan base. against a common obstacle, not against each other. identify the ingredients and count as they "cook"! • These toys will land in stores and at JCPenney.com starting in October. discover items to love for less time, money and effort. cuddly toy and a comfy hoodie. It’s an adventure waiting to unfold. twist to pretend kitchen play. microwave , blender and toaster detailing, along with drawers and shelves. • Pots & Pans are stainless steel and can be used to prepare real food. • Pretend food is cloth and weighted for a great feel and texture. the shell to excavate the dinosaur inside. dino discoveries making it a perfect group or party activity! life and make it engaging and realistic to kids. vehicle to hear hydraulic sounds and flash the lights.